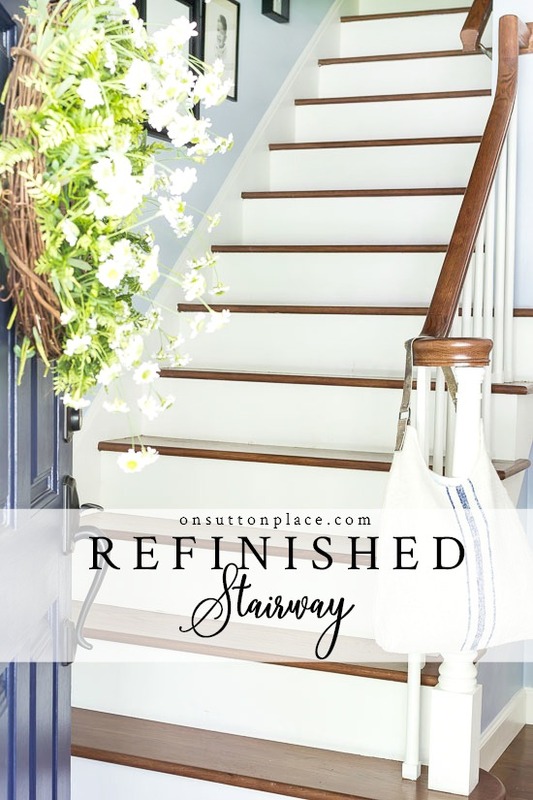 In this post: A refinished staircase project that begins with removing old carpet from the stairs and ends with a totally transformed space. 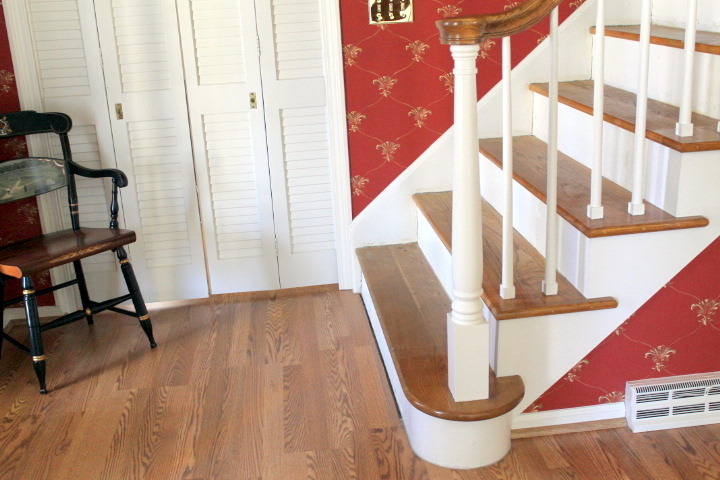 When I began this refinished staircase project, there were three things I didn’t know. 1.) That it would take forever. 2.) That there was so much more to it than just removing some carpet. 3.) That it would be the biggest transformation I have ever accomplished. I wanted to remove the carpet. The wallpaper had to go. The brass finishes needed an update. When the carpet was removed, I was totally elated to find oak hardwood steps and risers in very good condition. I wasn’t so lucky with the walls under the wallpaper. The drywall was a mess…but I’ll get to that later. Steps first. Here they are (in the picture below) before we started the refinishing process. Really not bad at all. The first thing we did was sand and fill in the holes on the treads. After that the stain was applied and then 3 coats of poly. We opted to apply the finish on all the steps at the same time and get the process over with. The other option was to do every other stair over 2 days. (The day the poly was applied we slept downstairs.) Here they are stained, sealed, and the risers painted. 3. Tape off treads again. I tried leaving the tape from the caulk step on for the painting step, but that was a disaster. The caulk came off with the tape. Thankfully I started with just the top 2 steps so I was able to re-think my process before painting all the risers. 4. With fresh tape, I primed the risers followed by 2 coats of paint. With the steps finished we moved on to the walls. We applied a skim coat before priming and painting two coats of Sherwin Williams Upward. I really think it was the most important step in the painting process. Wallpaper can hide a multitude of sins…paint not so much. After sweating it out refinishing the steps, I didn’t want to go only halfway on the walls. It took longer and was no fun. Honestly, it was awful, but in the end I am so glad we did it. I replaced all the brass hinges, door knobs, switch plates and the ceiling light with new Oil Rubbed Bronze fixtures. I got all the hinges on eBay for much, much less than I could find at my home improvement stores. I started buying all the new fixtures right after Christmas and was able to spread it out over several months. It was so much easier than spending a big chunk of change all at once. The only hinges I didn’t change were the ones on the front door. I taped them off, primed and then painted them with some ORB spray paint. I just sprayed the paint into a throw away bowl and used a little brush. They look great and you would never know they were once brass! 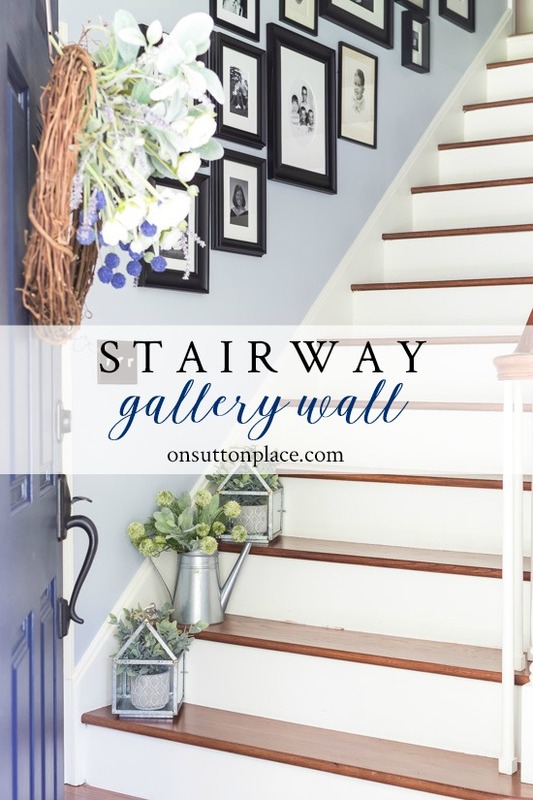 The last step to complete this refinished staircase project was to re-hang the gallery wall pictures. I waited a long time to do this. The walls turned out so good that I had a hard time pounding nails in them! But hang the pictures I did and now I love it. I used this little tool that I saw online. Just put a screw in the end of a paint stick. Hang the picture on the screw and figure out your placement. Gently push the screw into the wall. Use the little indentation in the wall as your marker for the nail. I hung all these pictures in just over an hour and that included figuring out the placement first. This project wasn’t quick or easy. There were times when I wondered if I was nuts to even be attempting it. I can truly say now that it was worth every sore muscle, every tear (yes, there were a few,) and all the mess and confusion. I was wondering if you have found your stairs to be too slippery without the carpet? We are thinking about removing our carpet from the stairs but I have concerns for us in stocking feet and for our lab who goes up & down them. Can you share your thoughts now that you have lived without the carpet? Thanks. Btw….it looks beautiful! It took us a while to get used to it. I had trouble with black marks on the risers too…from shoes. I slowly trained my husband and now I have hardly any black marks! Our dog used to fly up and down the carpeted stairs. She learned the hard way to slow down. She fell down them twice at the beginning but then adapted and has been fine ever since. I don’t have children who live here so it’s just the two of us and the dog. 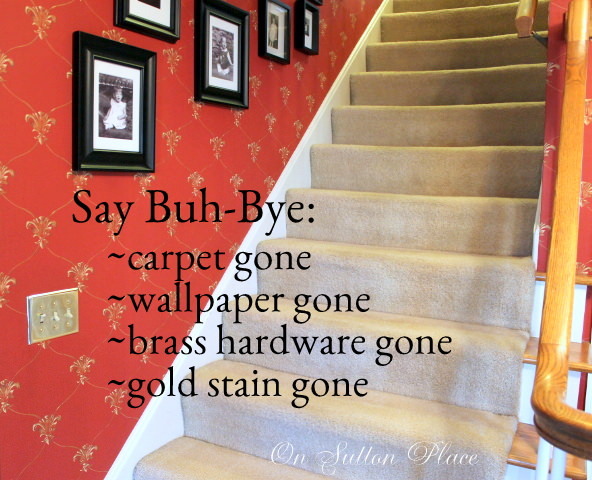 We do fine…and the trade off for not having dirty carpet on the stairs was definitely worth it! OMG, this is one of my projects to do! I just told my husband I wanted to take up the carpet and have the stairs exposed! I am getting ready to re- do my gallery wall also. I hope mine turns out as beautiful as yours! I too have recently quit my job to peruse my dreams on blogging and selling on Etsy! I think we were sisters separated at a young age! LOL! 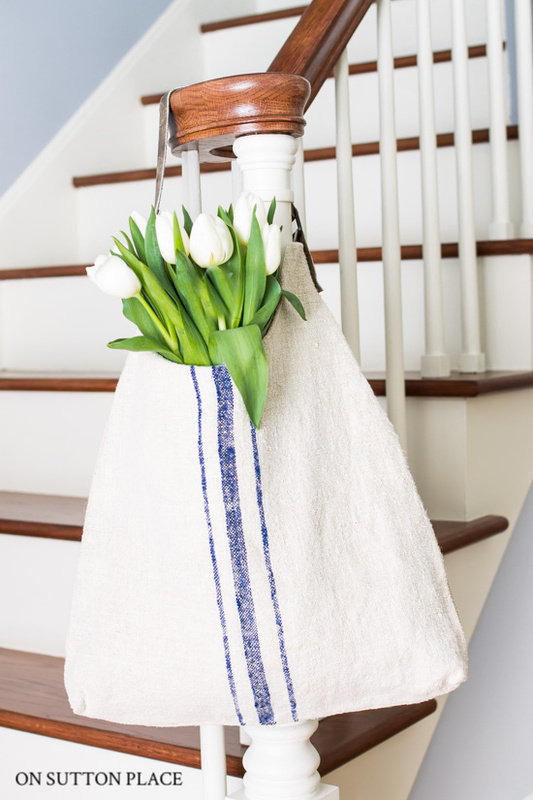 Your entryway is gorgeous. I really hope that wallpaper doesn’t come back into style for a long time. I have stripped way too many walls in my time and there’s always a surprise to be found underneath. Love the skimming idea. When we sold my MIL’s house the contractor did that and I had totally forgotten about it until you mentioned it. I love the way your entry turned out. It reminds me of our former home. We didn’t have the money or the time to do that house up the way I would have liked. I always wanted to do the gallery up the stairway. I can just imagine that it would have looked like yours. That entry makeover is beautiful! You did it well!! Gives me hope for our basement project that also started out small and morphed into major. I do wish we were finished though! Hi Ann! Oh, I just love your pretty entry! Love all you did and I’ve got to remember the paint stick tool – that’s a great idea. Your items are always so beautiful! You did a beautiful job! I cannot imagine HOW I am going to redo my stairs with all my fuzzy friends running amok!? Gorgeous entry! Love this soft color . The stockings are adorable! I love your entry! It is so fresh and so welcoming. LOVE the colors!!! Your stockings are like everything you do… gorgeous! LOVE the fabrics!!!! They look like they could hold lots of goodies from Santa! Ann – Your entry is just beautiful! I love the wood and paint finish on the stairs. It looks so rich. I know it had to be alot of hard work but it was definitely worth it. Looks great. Good job! I always hit my favorite stores when I need some inspiration, it works every time! I either come home with something new or I’m motivated to not spend any money and recreate something I already have! LOVE your new stairway, you have inspired me to update my bedroom hallway, Thanks! Your stairs are gorgeous. I would love to do this with our stairs. 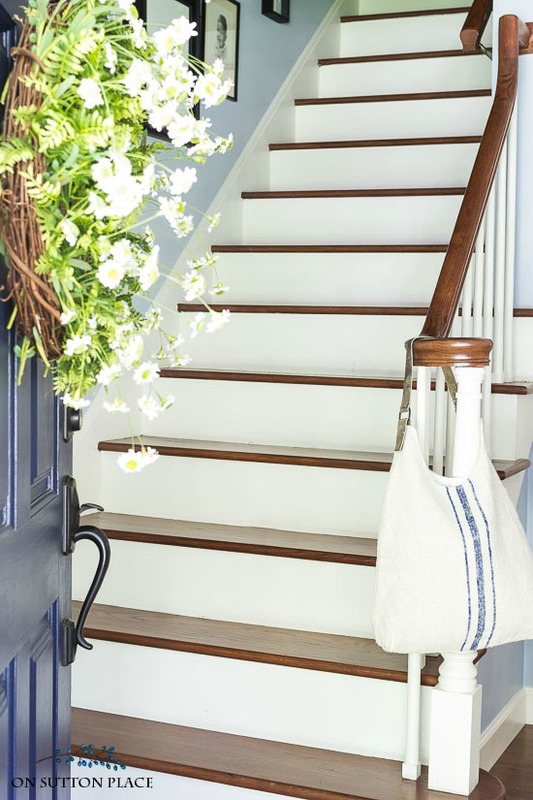 Gorgeous stairwell and entry way Ann…such a light and fresh look that you have so beautifully accomplished…Christmas decorating?…I have already started! !….Wonderful stockings!! It’s amazing, Ann! I feel the same way… not in the mood for fall decorations, but it’s too early to start on Christmas… but I’m doing it anyway! Your stocking are gorgeous… Those puppies should sell out quickly! 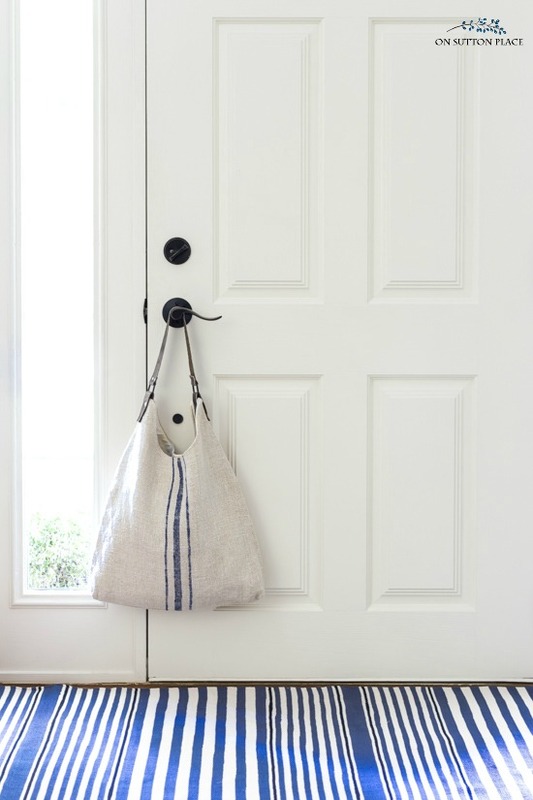 Love the fresh look of your entry! Now if I can just talk my hubs into doing this for us ! It looks wonderful and clean crisp ! 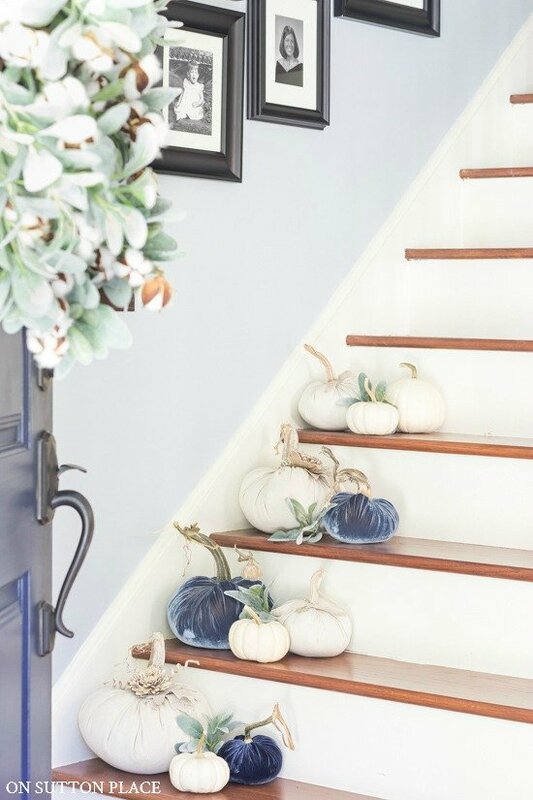 Your entry way is so pretty! Love the stockings that you made. I’ve been working on stuff for my Christmas show that is on Thankgiving weekend. No help on where to get inspiration at…I’ve been having a really hard time with that too. 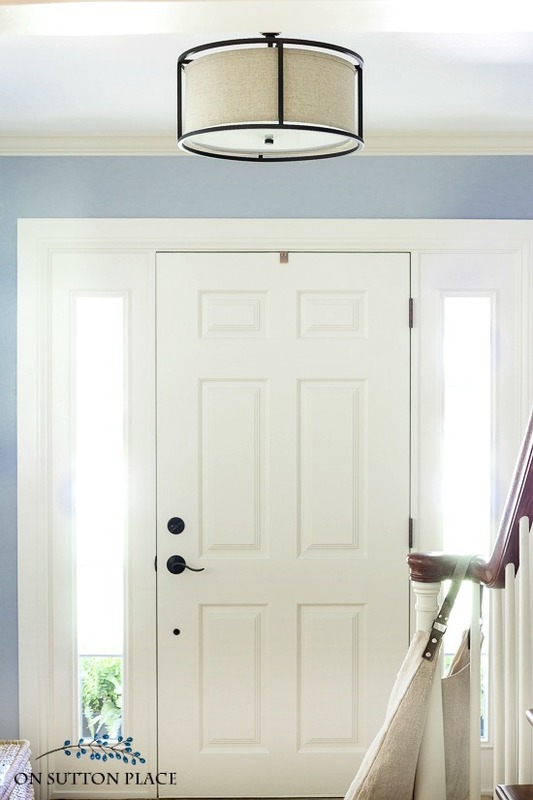 Your entry way is beautiful, it’s always worth the huge effort that it takes to make a room the way that you’ve imagined it to be. Now you will enjoy it for a long, long time, it’s a look that will always look good.